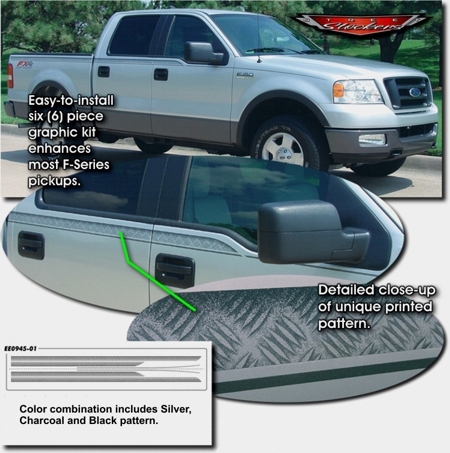 Engineered specifically for the Ford F-Series Truck bodylines, this unique graphic package truly captures that "Factory Look" with a progressive, tasteful automotive design. Graphic package showcases a stylish printed pattern that integrates extremely well with the overall vehicle appearance. Kit fits all '04-Current F-150 and '98-Current Super Duty trucks. Available here in Neutrals color scheme (Silver, Charcoal and Black).